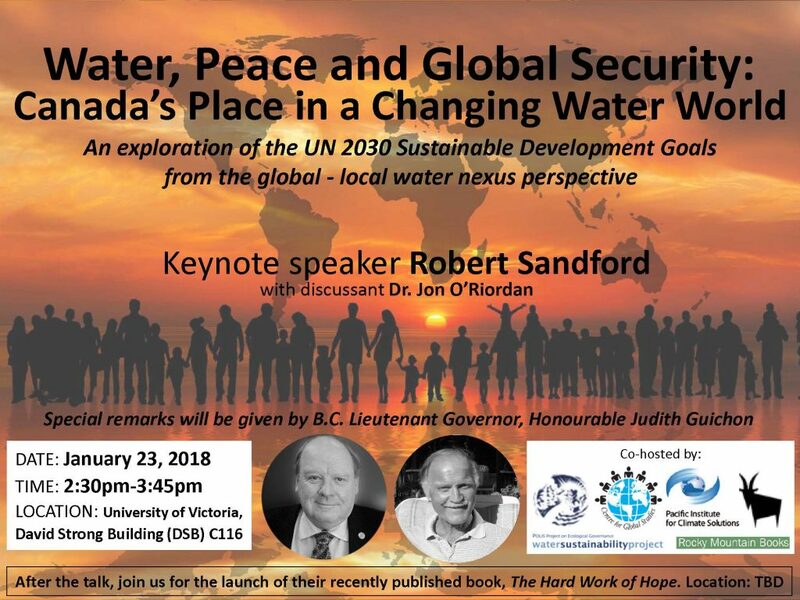 The POLIS Water Sustainability Project, the Centre for Global Studies, Pacific Institute for Climate Solutions, and Rocky Mountain Books hosted an intimate conversation with two of the world’s leading water experts. Robert Sandford (EPCOR Chair in Water and Climate Security at the United Nations University Institute for Water Environment and Health) and discussant Dr. Jon O’Riordan (Strategic Advisor, Water Policy, POLIS Water Sustainability Project) explored the UN 2030 Sustainable Development Goals from the global-local water nexus perspective. Special remarks were given by the B.C. Lieutenant Governor, the Honourable Judith Guichon. The slides from the presentations can be downloaded below.